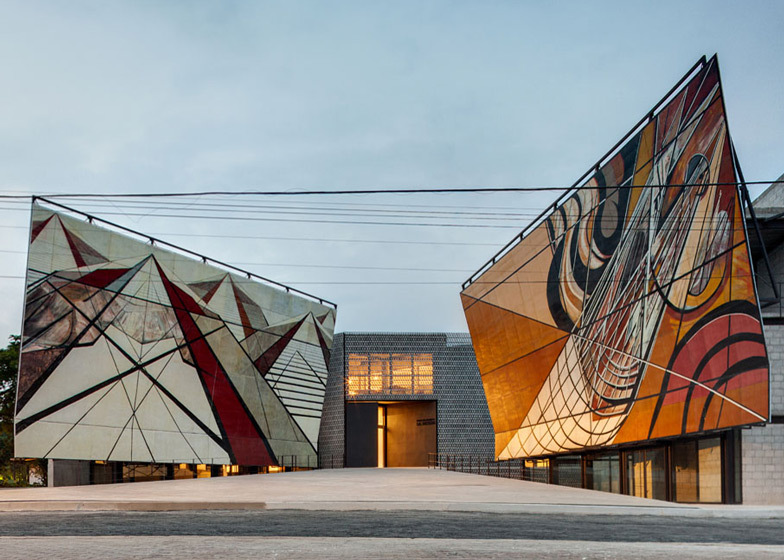 Mexican architect Frida Escobedo has transformed the former home and studio of painter David Alfaro Siqueiros into a public gallery and encased the entire complex behind a triangulated concrete lattice (+ slideshow). 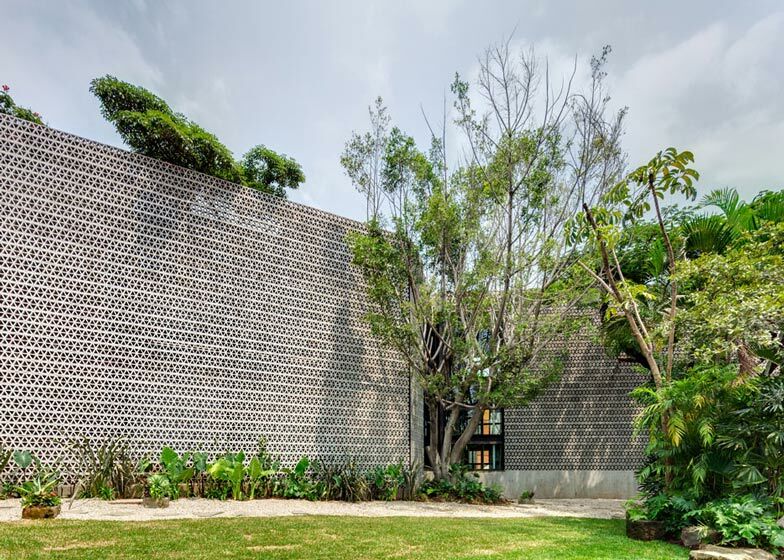 Young architect Frida Escobeda reworked the complex built in the 1960s by late artist and political activist Siqueiros as a mural painting workshop, creating an art gallery and artists' residence in the small Mexican city of Cuernavaca. 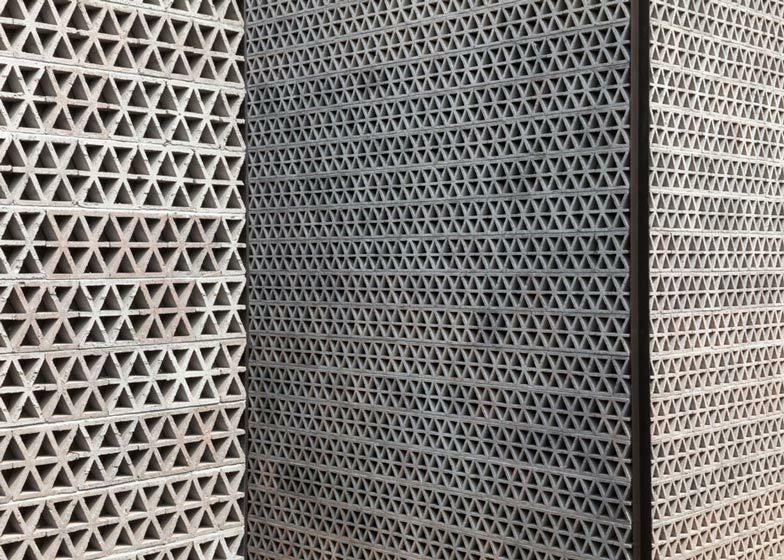 A wall of perforated concrete blocks was build around the perimeter of the La Tallera de Siqueiros complex, forming an enclosure around the buildings that groups them together but also allows light to filter through. Two large murals painted by Siqueiros were moved from their original positions around a private courtyard to frame a new entranceway - a move that Escobeda says was key in opening the complex up to the public. "Rotating the murals ignites the symbolic elements of the facade's architectural syntax, altering the typical relationship between gallery and visitor," she said. In their new positions, the murals provide a framework for the cafe and bookshop, but also help to separate the gallery building from the old house, which now functions as a base for artists in residence. 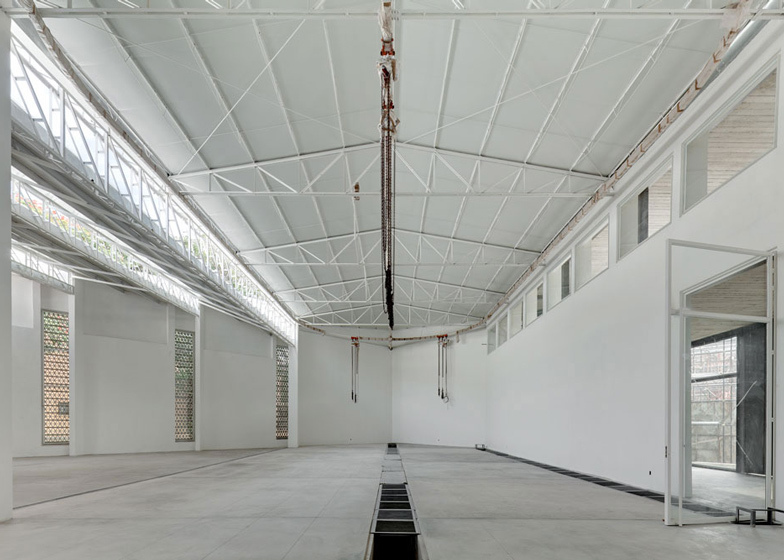 Siqueiros's former workshop remains largely unchanged but had been coated with white paint to create a neutral gallery space. Extensions have been built from concrete, with an exposed surface that reveals the markings of its timber formwork. 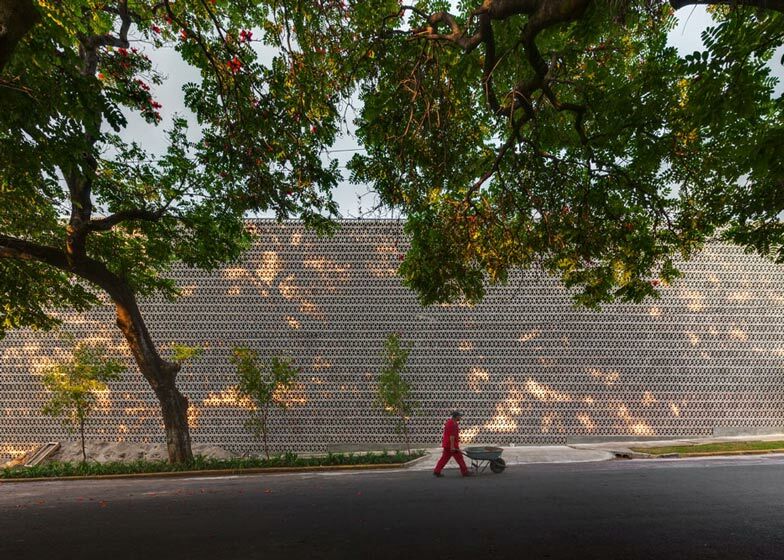 La Tallera de Siqueiros was one of 14 architecture projects shortlisted for Designs of the Year 2014 earlier this week. La Tallera Siqueiros generates a relationship that reconciles a museum and a muralist's workshop with the surrounding area by way of two simple strokes: opening the museum courtyard onto an adjacent plaza and rotating a series of murals from their original position. 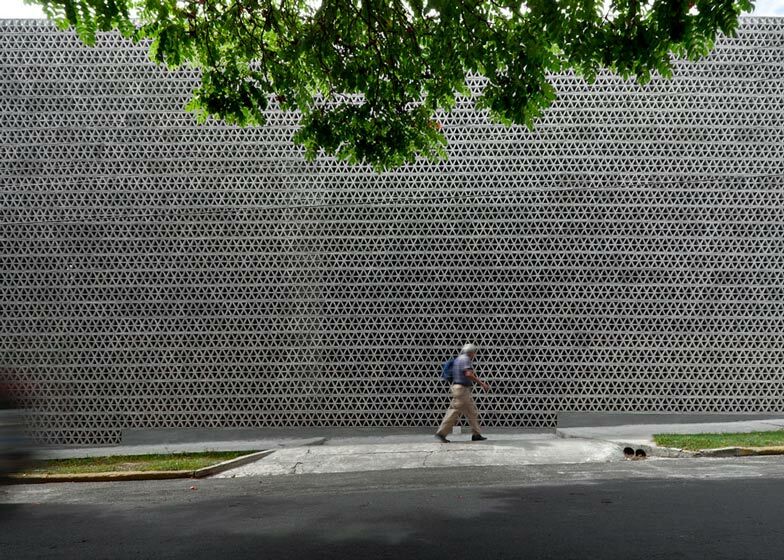 The space itself was built in 1965 and became the house and studio of the muralist David Alfaro Siqueiros during the final years of his life. La Tallera is "an idea Diego Rivera and I came up with in the 1920s to create a real muralist workshop where new techniques in paint, materials, geometry, perspective and so on would be taught". This is how Siqueiros himself defined this workplace, now a museum, workshop and artist's residency program focused on art production and criticism. By opening up the courtyard, the museum yields a space for shared activity, while also appropriating the plaza. The murals, originally intended for the outside area, now have a dual role: firstly, as a visual and programmatic link with the plaza by encompassing the public areas of the museum (café, bookshop and store) and secondly as a wall/program that separates the artist's residence from the museum and workshop. 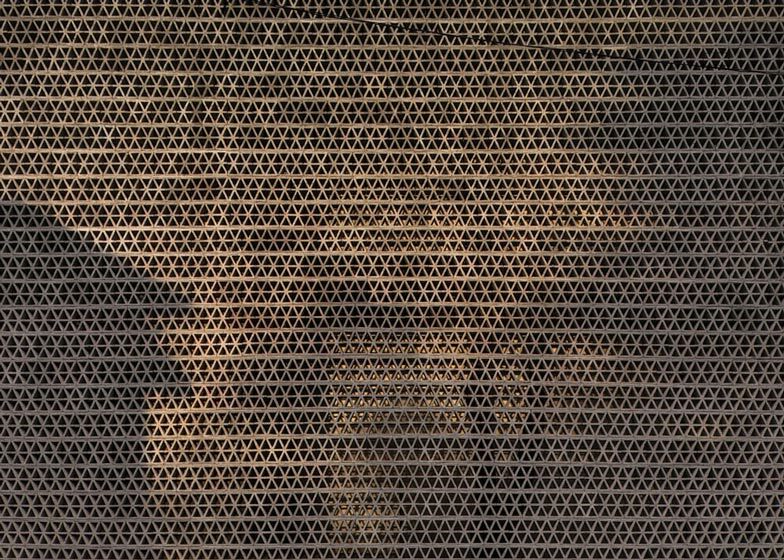 Rotating the murals ignites the symbolic elements of the facade's architectural syntax, altering the typical relationship between gallery and visitor. Like the exterior, the gallery space, from both an exhibition design and artistic perspective, though unfolding, generates new relationships and spatial connections. 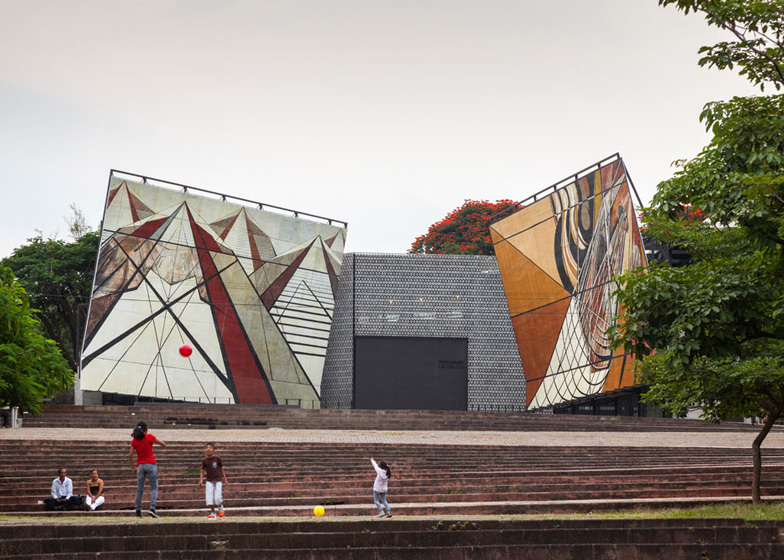 The distribution of these spaces and the interplay of planes - in murals and walls among others - is revealed in crossing a perimeter lattice that demarcates the urban surroundings - a single horizontal sculptural piece that contains and displays Siqueiros' work.